The Florock selection of decorative epoxy floor coating systems for commercial applications, including epoxy quartz, decorative vinyl flake chip blends, solid color epoxy and decorative metallic floor coating materials, give you the options you need to suit any space. Beautiful colored quartz blends and epoxy resin systems offer the extraordinary strength and impact resistance of an aggregate-filled floor and can be applied using broadcast, slurry or trowel methods. Innovative colored decorative chip blend and epoxy resin finishes provide the look of terrazzo floors at a fraction of the price, and cost much less to maintain with no waxing or special buffing needed. Florock metallic “faux stain” flooring provides the organic beauty of stained or polished concrete, yet with far superior performance. FloroQuartz Systems are epoxy quartz flooring solutions that provide decorative, sanitary, slip-resistant and exceptionally durable concrete floor toppings. 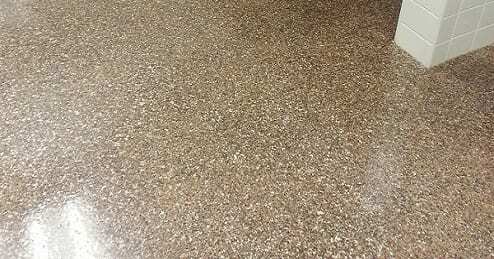 This high-performance epoxy polymer resin, when combined with blended color quartz granules, results in a multi-functional floor with style, strength and superior life cycle value. FloroQuartz epoxy quartz floor coating systems are designed as broadcast systems, troweled systems or as a high build mortar and broadcast system. FloroChip is a decorative flooring system that offers a variety of colorful options and is easy to maintain. 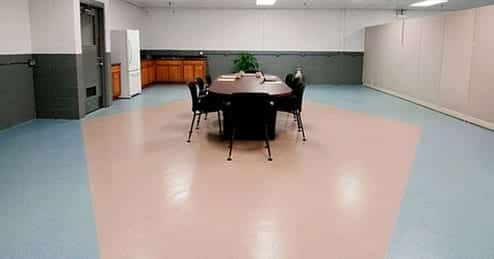 FloroChip decorative epoxy vinyl flake floor coating systems are ideally suited for commercial, industrial and light institutional applications, such as: Auto showroom floors, Office lobby floors, Nursing home floors, School floors, and detention facility floors. FloroMica decorative mica flake epoxy floor coating system boasts an array of rich tones that mimics the elegance and appeal of architectural granite. Shimmering natural mica flakes accent the subtle undertones to create a beautifully unique finish with incredible depth, while durable Florock epoxy resins provide unparalleled high traffic protection. Florotallic is a decorative metallic epoxy flooring system with the look of a shimmering metallic stain. Versatile Florotallic can be used with a wide range of Florock flooring products and is available in a variety of colors and decorative effects to provide a unique and exciting floor. Florock metallic epoxy flooring is one of the most contractor-friendly epoxy metallic floor coating systems available in the industry, providing facilities with consistently high-quality floor protection that’s both long-lasting and stylish. 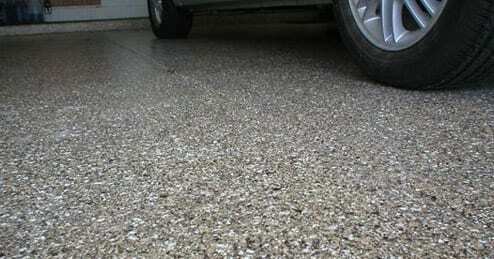 Product Description: FloroQuartz is a decorative and durable aggregate-filled commercial epoxy floor coating system. It provides a slip resistant and impact resistant surface with exceptional strength and wear characteristics. Product Description: Floroquartz TL is a 100% solvent free decorative and durable quartz aggregate filled troweled epoxy floor coating system. It provides a slip resistant and impact resistant surface with exceptional strength and wear characteristics. Product Description: Floroquartz HB is a 100% solvent free decorative and durable aggregate filled epoxy quartz floor coating system, beginning with a base coat of epoxy mortar. It provides a slip resistant and impact resistant floor coating surface with exceptional strength and wear characteristics. Product Description: The Florock EcoBlend system takes the FloroQuartz and FloroShop systems and incorporates recycled glass using 25% or 33% recycled materials to generate LEED points. A Florock Eco-Blend floor is easy to clean and maintain; it prevents concrete dusting and retains its color and durability over time. The amber glass goes nicely with both the Silica Sand for a shop floor and the Prairie Gold decorative quartz blend for a FloroQuartz floor, while the blue glass blends perfectly with the Skyline Silver and Night Sky Navy FloroQuartz floors. Impact Resistance: ASTM D4541 >160 in. lbs. 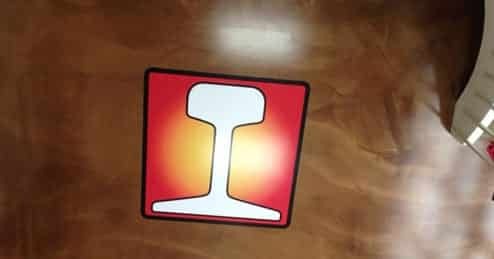 Product Description: FloroChip is a decorative epoxy vinyl flake flooring system that offers a variety of colorful options and is easy to maintain. Product Description: FloroMica decorative mica flake epoxy floor coating boasts an array of rich tones that mimics the elegance and appeal of architectural granite. Shimmering natural mica flakes accent the subtle undertones to create a beautifully unique finish with incredible depth, while durable Florock epoxy resins provide unparalleled high traffic protection. Product Description: Florotallic metallic epoxy floor coating system is a decorative three dimensional epoxy flooring system with the look of a shimmering metallic stain. The versatile Florotallic epoxy floor coating system can be used with a wide range of Florock flooring products, and is available in a variety of metallic colors and decorative effects to provide a unique and exciting floor.